Be a current student at UIW or have applied for full-time admission to the fall semester. Be a citizen of the United States, permanent resident, national of the United States, or an alien admitted as a refugee und section 107 of the Immigration and Nationality Act. Be eligible to receive federal financial aid and demonstrate financial need as determined by the FAFSA ( click to complete). Complete the SAMS at UIW application. 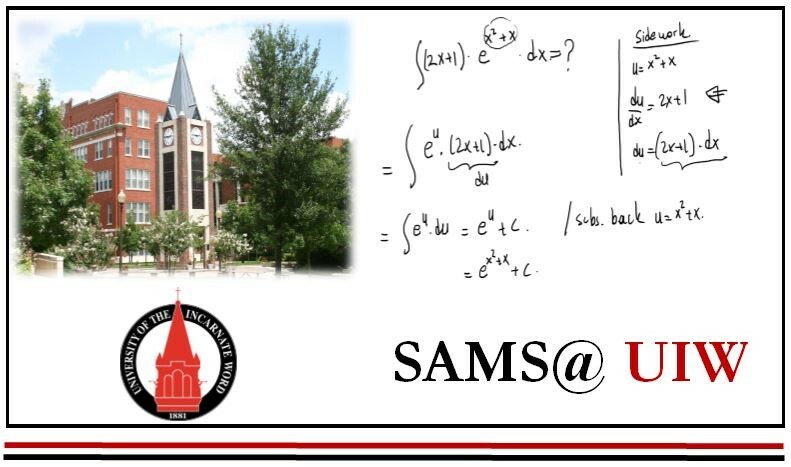 Apply for the SAMS@UIW Scholarship. Have an overall GPA of 2.8 or above, with a combined average of all college mathematics courses 3.0 or above. High school applicants must have an overall GPA of 82 points out of 100 points and the average of all high school mathematics courses combined must equal 82 points or above. Enroll in UIW as a mathematics or statistics major. Submit a resumé. (This can be emailed directly to Dr. Suleyman Tek ( tek@uiwtx.edu). Submit unofficial transcripts. (This can be emailed directly to Dr. Suleyman Tek ( tek@uiwtx.edu). Application deadline: Applications are accepted anytime and processed on a rolling basis until each years' funds are exhausted. For more information or questions about the SAMS@UIW scholarship program, please contact Dr. Suleyman Tek (tek@uiwtx.edu) or (210) 805-1228. This material is based upon work supported by the National Science Foundation under Grant No. 1458026. Any opinions, findings and conclusions or recommendations expressed in this material are those of the author(s) and do not necessarily reflect the views of the National Science Foundation (NSF).